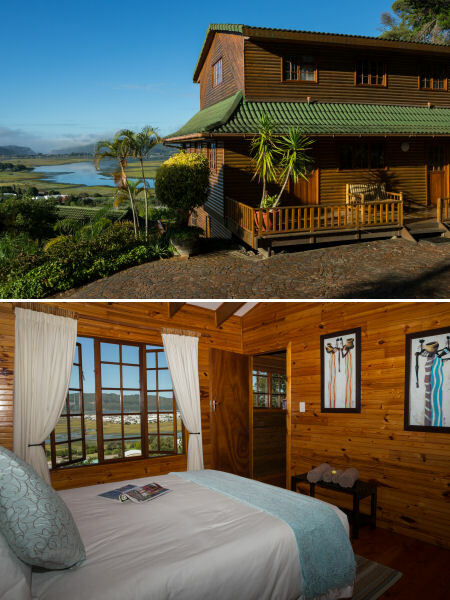 The Big Tree House Lodge – your ideal self-catering accommodation in Knysna on the Garden Route. The Big Tree House Lodge offers guests self-catering accommodation in three well-equipped units, which are reached via wooden walkways meandering through our magical gardens. Each unit offers privacy, off-street parking and unrivalled views over the crystalline Knysna lagoon and through the famous Knysna Heads. All units boast a private deck with braai facilities including firelighters, charcoal and braai grids. Also standard in each unit are flat screen TV’s with satellite television, fully equipped kitchens and free WiFi. Towels and linen are provided, as are heaters, hot water bottles and luxurious blankets during winter. Basic toiletries are provided, as are coffee and tea upon arrival. All three our units are connected to a water purification system and we provide guests with twice-filtered drinking water. The double-story, timber framed main unit comfortably sleeps six to eight guests in three en suite bedrooms, each of which enjoys incredible views. 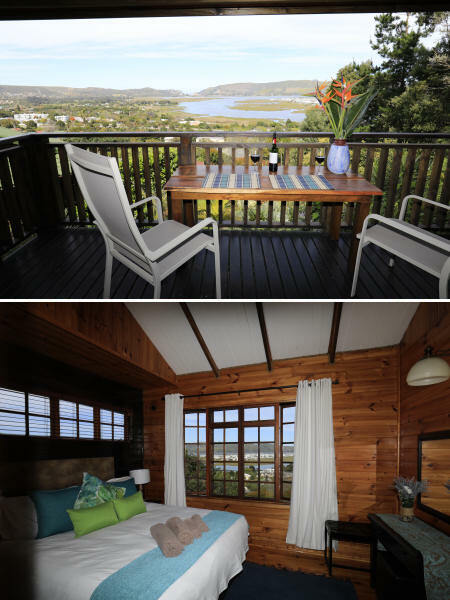 The open plan, yet clearly defined kitchen, dining and lounge areas on the lower level offer guests inspiring views over the Knysna lagoon and through the Knysna Heads. The lounge, with its flat screen TV and satellite television, opens onto a private deck with braai facilities. A double room with en suite shower leads off the lounge. A comfortable staircase leads to the upper level and two more en suite rooms. The twin room with single beds and comfortable double sleeper couch, en suite bath is perfect for children, family members or friends traveling together. The third bedroom with a queen size bed en suite shower offers private relaxation. The open plan kitchen and lounge are separated by a convenient dining counter. The lounge, with flat screen TV and satellite television, opens onto a private deck with braai facilities. Also leading from the lounge is a comfortable double room which features a bay window and en suite shower. The second bedroom features a queen size bed, adult size bunker bed and en suite bathroom with a bath. 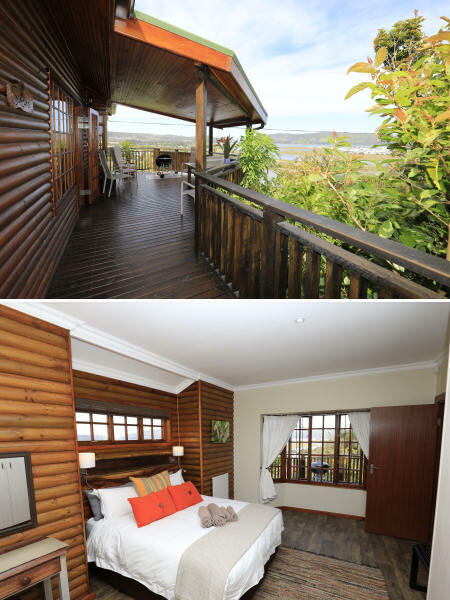 Enjoy awesome views across the lagoon and Knysna Heads from both bedrooms, as well as from the lounge and deck. This double-story unit consists of 2 private bedrooms en suite bathrooms. The open plan kitchen, dining area and lounge boast magnificent views across the lagoon and Knysna Heads, as does the double room with en suite shower leading off the lounge. The second bedroom downstairs consists of 2 single beds, a double adult size bunker bed and full en suite bathroom with bath and shower. Leading from this lounge is a wooden deck with views of the Lagoon. The upstairs lounge features a flat screen TV with satellite television and opens onto a private deck with braai facilities. This apartment is situated underneath Big Tree House and consits of 1 private bedroom en suite bathroom. 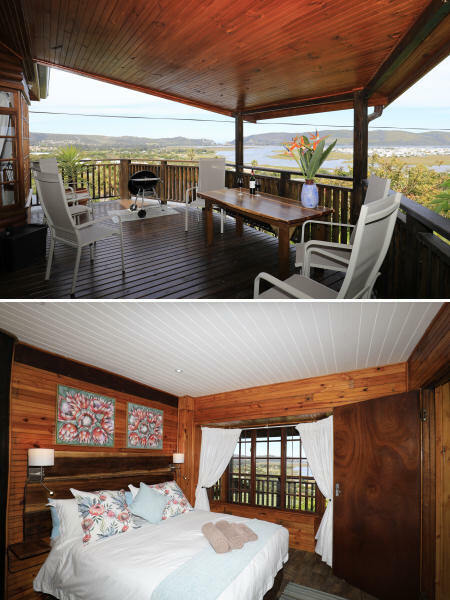 The spacious open plan kitchen, dining area and lounge has magnificent views across the Knysna Heads and Lagoon. The lounge offers flat screen TV with satellite television and opens up to a large covered deck with braai facilities.